TPU got its hands on a picture of Zalman's Reserator, a new sealed liquid cooling kit that will be launched in early 2013. This new processor cooler features a CPU block with a mirror-like copper base and uses a heatsink-like radiator with radially-projecting copper fins that are cooled by a 120mm Zalman blue or red LED PWM fan. The cooler can reportedly handle thermal loads of up to 400W.
. The Korean PC cooling veteran unveiled Reserator, a liquid cooler which swaps the conventional-looking radiator for a high-performance heatsink with radially-projecting copper fins, in which the heat pipes are swapped with coolant channels. 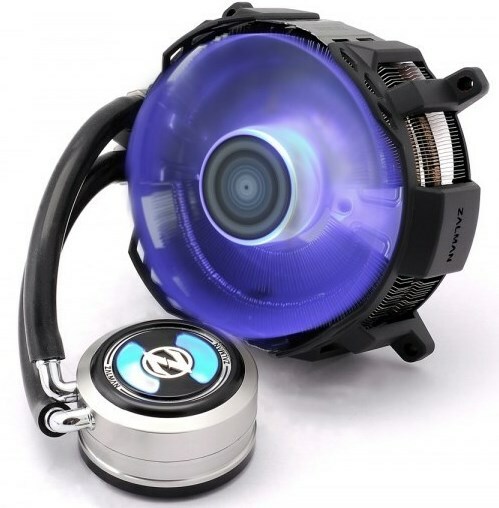 The contraption is ventilated by a 120 mm Zalman custom-design blue or red LED-lit fan, with PWM control. The CPU block features copper base with mirror finish, while its other parts are given aesthetic touches with chrome plating and LEDs.